A good friend of mine recently reminded me that a section on where to source materials for making mosaics from might be a useful collection of information for those wishing to partake in such a craft. I could not agree more. First and foremost the most useful supplier that I have found is the mosaic workshop, a shop based in London but with a brilliant online shop means that I have managed to source all of my materials and core tools from one place. If you are a making your first mosaic then I would advise buying one of the mosaic kits that they sell. At roughly £40 a piece, they include all the tools and materials that you would need: tile clippers, adhesive, grout, protective goggles, a board to support the mosaic, the pattern, and finally enough tesserae with enough to spare. The great thing about this approach is that the design guides you through the process so, depending on the pattern chosen, you will learn how certain shapes and motifs are composed. Secondly you then have the core tools for any later endeavours that you might embark on. When you come to actually make the mosaic you will rapidly find that some other small items are surprisingly important to the endeavour. Tubs for holding the tesserae are essential. So if you can, collect small lunchboxes, yoghurt pots or magerine/butter tubs. 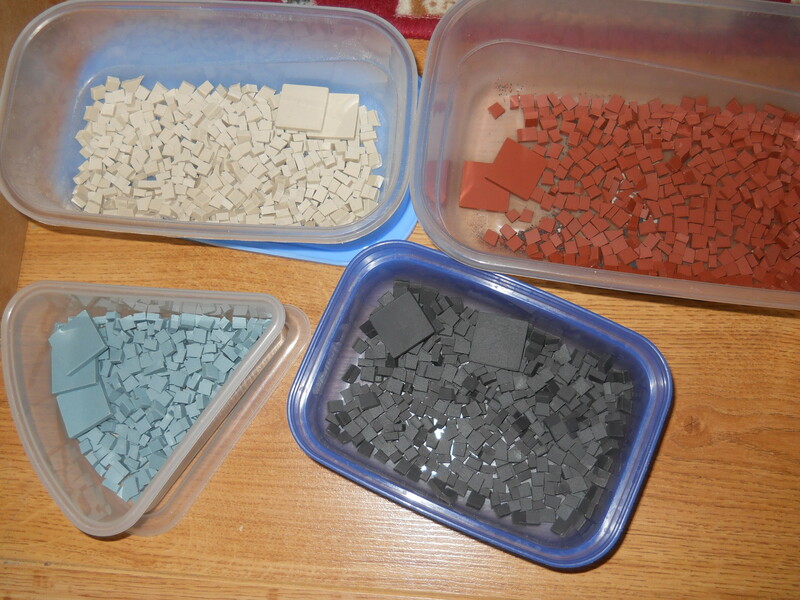 Such containers allow you to cut tesserae in bulk and store them in advance, multiple tubs allow you to separate them by colour, yet again speeding up the process. Three other small items that will help are a small brush for applying the glue to the board to lay your tesserae, a pair of rubber gloves for grouting, and a cloth to wipe the mosaic clean. If you, like me, go on to make additional mosaics of your own design then a good geometry set is a must have for constructing the plan or the net of the mosaic. Do not try to lay the tesserae free hand unless brave or very accomplished at art. Archaeology has demonstrated that the Romans etched the designs onto the floor before making them and did so for good reason. The plan/net acts a guiding hand when you lay the tesserae and the act of drawing them allows you to visualise the pattern and see if it works before you commit to it in permanence. The more complex the design the more complex the net, they take time to draw but it’s worth it. Once you have all your tools and if you are just shopping for tesserae there are a lot of options available ranging from ceramic to gold plate tesserae. Or you could even collect and cut broken tile, mirror or pottery to form your own tesserae. With this in mind it is important to spare a thought for the thickness of your proposed material. You need them to be the same so as not to cause bulges in the finished product. Indeed even store brought tesserae come in different sizes so do remember to check that. Personally I buy all of my tesserae from the one place, the mosaic workshop, so that they are all of the same standard and ensure the best consistency. Obviously there are other suppliers out there and some aspects can be acquired from local hardware shops such as getting tile gutters, grout and bases however with regards to the tesserae, it is much easier to get them from a specialised provider. Hopefully these words will have been of some use to somebody and if you seek further advice on materials technique or design, feel free to contact me. Alternatively I’d happily draw a design or make a mosaic piece for you, but for a commission!